If all the hype surrounding today’s iOS 5 release isn’t your thing, don’t worry – we’ve got you covered. DejaOffice 1.12.2 for Android has just landed in the Android Market and will be in the Amazon Appstore soon. If you’ve been following along with our beta builds, this is an official release. For those who haven’t, this update brings a host of new features. I’ve mentioned some on the blog already, but I think a few of them are worth highlighting again. For the world travelers our there, this feature should prove to be indispensible. The next time you change time zones, DejaOffice will ask you if you’d like to enable time zone shifting. There are three options: Yes, No, and Not Decided. 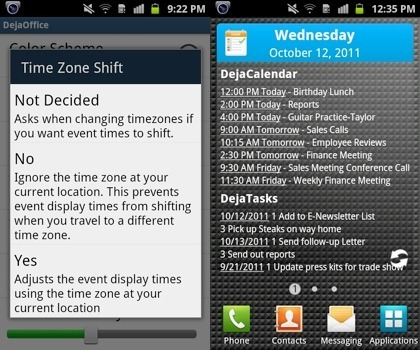 Selecting “Yes” adjusts your tasks and calendar events to the current, local time zone. This means an event at 4pm PST will be display as 7pm EST, for example. Choosing “No” ignores your current time zone. This means an event at 4pm PST will display as 4pm EST. Opting for “Not Decided” simply allows you to choose yes or no every time you enter a new time zone. The DejaToday widget is now able to displays events beyond the current day. This is great for those who like to have an idea of what’s on the agenda tomorrow. To enable this feature, head into the DejaOffice Settings, choose DejaTasks, then select the number of Future Days you’d like to show. It’s that easy. Of course, with an update this big, there’s a large number of performance and stability improvements, as well as bug fixes. We’ve worked hard to make DejaOffice 1.12.2 a great update. It’s available now in the Android Market and Amazon Appstore, so update today and start taking advantage of the new features! For the full list of release notes, head over to the DejaOffice website. And be sure to let us know what you think in the comments below! This entry was posted in News, Support Updates and tagged amazon, android, dejaoffice, feature, time zone, update, widget by David. Bookmark the permalink.